I need a caddie. And bad. I think if I won the lottery, I'd hire a caddie. That's about the only luxury I'd want. What's my problem? Well, there's the issue of reading greens, which I can't do. However, my putting stroke is very good, and my speed is usually quite good, so I sometimes make putts by accident. No, where a caddie would be of greatest help to me is in club selection. I'm one of those guys who simply can't believe that he hits the ball one, sometimes two, clubs less than he used to. Many amateur golfers share this trait: when we reach into the bag to pull a club for the next shot, we're thinking of the farthest we've ever hit a particular club, rather than the average distance we hit that club. Coming up short is a commonality among amateurs. It's as if we have some psychological barrier to going long. Going over the green must be a truly terrifying prospect. During a recent round, I came to a hole where I am always short of the green. Always. It's a shallow, elevated green, and I never hit more than pitching wedge into it, yet I'm always short. I told my partner, "Today it's going to be different. Today, I'm hitting a 9-iron and I'm not going to be short, even if it means going over." I was short. Somewhere between the time of my declaration that I didn't care about going over the green, and the time my club made contact with the ball, this thought must have occurred to me: Don't swing so hard or you're going to go over the green! A teaching pro friend does a simple demonstration with his students when he takes them for on-course instruction. He tells them, "You pick your clubs the first few holes, and then I'll pick your clubs on the next few clubs." They always score better when he's picking their clubs - because they're much more likely to get the ball to the green. This isn't new information to me, however. I'm ashamed to admit that one of my childhood buddies, a scratch golfer, used to tell me the same thing. "Bogey, I'm beggin' ya, just let me pick your clubs for you. I'll take six strokes off your score." So, yes, if I win the lottery, I'm hiring a full-time caddie. In the meantime, next time I get to that hole, I'm going to hit the green. No, really, this time I mean it. I'll pull an 8-iron. Heck, a 7-iron, if I have to. But I won't be short. Even if it means going over. Alligators aren't uncommon sights on golf courses in East and Southeast Texas and in many locations along the coastal plains of Texas. I grew up in Corpus Christi, where several times a year we'd head over to the municipal course in small-town Sinton. It's inside the Rob and Bessie Welder Park, another part of which is a nature preserve. A little par-3 runs alongside a back fenceline, with a short carry over a tiny pond. But there was a sign next to that tiny pond: Alligators - don't search for balls in the water. 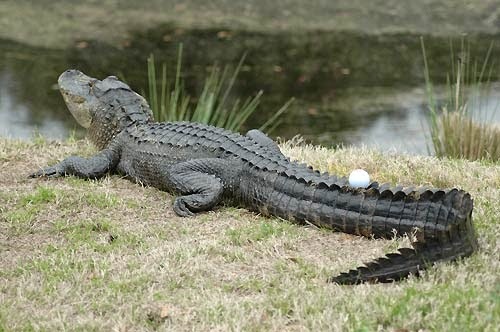 For several years at Oso Municipal Golf Course in Corpus Christi, a large gator took up residence in the pond near the 14th, 15th and 16th holes. This 6-footer could often been seen sunning itself on an embankment about 30 yards in front of the No. 15 tee box. But the golf course where I've seen the most, shall we say, dangerous and/or annoying wildlife was a golf course that no longer exists and, in fact, really never did exist. It was Goose Island Country Club. Goose Island is a spit of land north of the bayside community of Rockport, just over the Copano Causeway bridge that spans Copano Bay. It's home to Goose Island State Park and to Big Tree (state champion coastal live oak in 1969, and believed to be one of the largest oaks in the country ... but you already knew that, right?). I was around 12 years old, and was heading to Goose Island with my family. My parents were in real estate, and they noticed a new subdivision being built so we drove into it to check it out. We stopped in the "show room" and talked to the realtor on duty. He told us about the golf course that was being built as the centerpiece of the neighborhood. Nine holes were close-to-complete, he said, with another nine on the way, with the first nine just needing finishing touches. Schmoozing, my parents asked if we could play the nearly-complete nine. We had one set of clubs in the trunk and two unopened 12-count boxes of balls. The real estate agent said, "what the heck, go for it," and we did. Those nine holes were a managerie of gators, snakes and insects. The place was thick with 'em - it was literally crawling with them. Every embankment had gators or snakes sunning themselves, every fairway had things slithering across it, and the air - especially around the greens where the thick brush and trees closed in - was choked with bugs. It only took us about six holes to lose every ball we had, mostly because we were afraid to look for them if they missed the fairway. Years later, I tried to find out whatever happened to Goose Island Country Club, but as far as I can tell, I'm the only person who's ever heard of it. It never opened, as best I can determine, and faded back into the brush. Michelle Wie fever is back! Or at least, Michelle Wie is back - she's dominating talk in golf right now after her U.S. Women's Open victory. As far as we're concerned, there's never a bad time for Wie talk. And there's especially never a bad time for photos of Michelle Wie in a bikini or swimsuits. So here's another celebratory post: Michelle Wie bikini pics. Michelle Wie "tabletopping" (take that, critics!) while chugging from the US Women's Open trophy. How can you not love this woman? Wie's message with the photo? "So ... this happened last night ... #tabletopping #istillcantbelieveit"
You can tell a lot about how popular a pro golfer is with his or her peers by how those peers react on Twitter to a win by the player. In Michelle Wie's case, you can that she is very popular with her peers. Here's a look at Twitter reaction from other pro golfers after Michelle's 2014 US Women's Open win. Congrats major champ @themichellewie...don't worry I'll pay up! Congrats to Michelle Wie. Kept believing in that approach to putting. Shows great conviction. Love it. Congratulations to @themichellewie on winning the US Open. Fantastic achievement and still only 24. Start of many I think now. Congratulations @themichellewie on a superb victory in #USWomensOpen & all my very best. You are great for golf. @garyplayer @usopengolf @themichellewie that win will now be even sweeter given she was truly tested on 16! Awesome! Congrats Michelle!! Congrats @themichellewie for a great win!! Great golf and determination!! Congratulations to @themichellewie 😊❤️😊. Great playing!!!!!! Congratulations Michelle Wie on winning the 2014 U.S. Women's Open. And male TV viewers everywhere thank you for wearing those little purple shorts during the final round. Here's a neat piece of trivia that I bet you didn't know. Since all four professional majors have been in existence (that's since 1934, when The Masters was first played), which golfer has finished in the Top 3 in those majors most often without winning? Yep: Lee Westwood. Westwood has eight total Top 3 finishes in majors, but has yet to win one. He finished second twice and third-place six more times.